Halifax by the Sea – Giant Fun Fair this weekend! The seaside is coming to Halifax, offering a great day out for all the family with theme park white knuckle rides, children’s entertainment and much more. This entry was posted in Get Involved / Have Your Say, July and tagged calderdale, Children and Young People, Children's Activities, Childrens Entertainment, Family Days Out, Family entertainment, Fun Fair, Halifax, Halifax by the Sea, Savile Park, Young People. Aged 16 – 19, unemployed, just left school or college and want to heck out local job vacancies or find out more about apprenticeships? Then go along to the Take Me On Training and Apprenticeship Showcase Event. This entry was posted in Get Involved / Have Your Say, July and tagged C&K Careers, calderdale, Employment, Event, Get Involved, Halifax, july, Support, Training, Young People. courses, leisure and meet your Careers Adviser with afternoon tea served 2pm to 4pm. Please call Melissa Bairstow on 07876 898334 – Mary Stanislaus on 07884 868265 – or call 01484 225500 and ask for Halifax Careers Centre if you’d like to go along. This entry was posted in Brighouse, Elland, Get Involved / Have Your Say, Greetland & Stainland, Hipperholme & Lightcliffe, July, June, Rastrick and tagged C&K Careers, calderdale, Employment, Get Involved, Halifax, Support, Teenage Pregnancy, Young People. The One Stop’s ‘Carriers for Causes’ grants programme is funded through the money raised from the 5p bag charge in One Stop stores in England, Wales and Scotland. Grants of up to £1000 will be available to support projects that ‘benefit local communities and are available for good causes within two miles of a One Stop shop – helping to improve lives and local places’. Carriers for Causes is a rolling programme, meaning that you can apply for funding all year round. Applications are shortlisted on a quarterly basis for panel decision which will take place every three months. Applicants will generally know the outcome of their application within 16 weeks of applying. This entry was posted in Brighouse, Elland, Get Involved / Have Your Say, Greetland & Stainland, Hipperholme & Lightcliffe, Rastrick and tagged calderdale, Funding, Get Involved, Grants, Groundwork. The search is on for dogs of all shapes and sizes, young or old, big or small, to go along with their family to join in the fun at the RSPCA K9 Party in the Park. There are 25 classes in the fun dog show including Dogs with Talent, Puppy Love and the judges will have a tough task selecting the winners! For enquires contact Lauren on 07538 114079. This entry was posted in Get Involved / Have Your Say, July and tagged calderdale, Event, Family Event, Get Involved, Halifax, july, Manor Heath Park, Pets, RSPCA Halifax and Huddersfield, RSPCA K9 Party in the Park. XS provides a wide range of exciting activities to help children stay healthy, try out some new sporting activities, play and help improve their skills. This entry was posted in Aug, Get Involved / Have Your Say, July and tagged calderdale, Calderdale Council, Do Something, july, North Bridge Leisure Centre, XS activities, Young People. 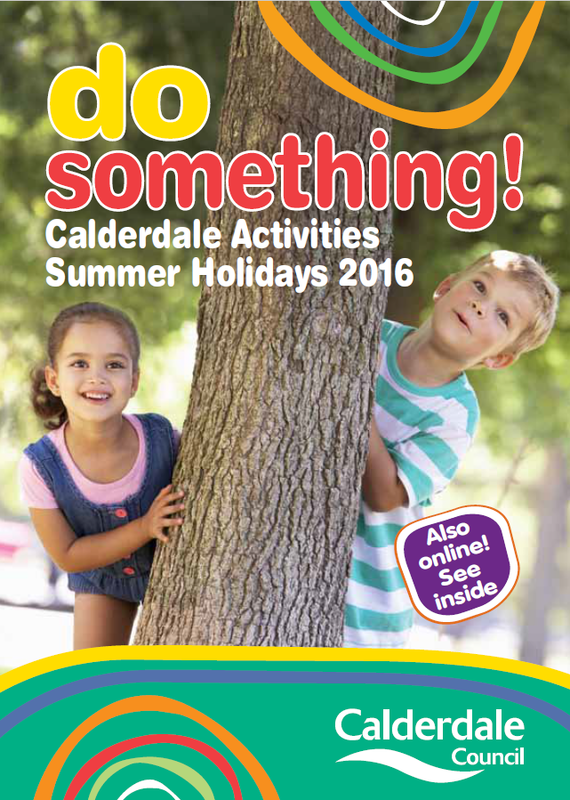 The Do Something guide helps you to plan an action packed holiday with your children in Calderdale. Whether you want to get out on your bike, stream dip for minibeasts, hunt for fossils or get down to the park for a bear hunt there’s lots to explore. If you’re batty about bats, curious about museums or mad about football, there’s so much to do the only problem you’ll have is fitting everything in. This entry was posted in Aug, Brighouse, Elland, Get Involved / Have Your Say, Greetland & Stainland, Hipperholme & Lightcliffe, July, Rastrick, Sep and tagged calderdale, Calderdale Council, Calderdale Libraries, Calderdale Museums, Children and Young People, Do Something, Events, Family Activities, Fun, Get Involved, july, Parks, September, Young People. We are extremely pleased to announce that Wellholme Park Children’s nursery has received another ‘Outstanding’ outcome on a recent unannounced Ofsted inspection. There is a superior awareness of safeguarding issues and staff’s collaborative working with other key agencies is exemplary. Staff have high expectations for all children. Their firm belief that all children are competent learner’s leads to exceptional commitment to inclusion. Staff model excellent social skills, which has a positive impact on children’s behaviour and friendships. Children show high levels of motivation, curiosity and creativity and their leaning is enhanced because of staff’s high quality interaction. “Everything is underpinned by the continual drive for improvement and self-improvement is key, all staff are involved, everyone had the same passion and drive and all are singing from the same hymn sheet, action plans in place, it’s exceptional. Staff having lead roles drives improvement and has a massive impact. Staff are well trained for these roles and support staff well. The staff team is well supported. Children are happy, social skills and independence is promoted, children in pre-school are well ready for the next step”. We are really pleased with this feedback and tremendously proud of our staff team and the children that attend Wellholme nursery and will be celebrating with a party! This entry was posted in Brighouse, Get Involved / Have Your Say and tagged Education, Get Involved, Learning, News, NHP Sure Start Children's Centres, Ofsted, Press Release, Sure Start, Wellholme Park Children's Centre, Young People. Lower Valley Friday Flyer 24 June – OUT NOW!! Engineers lay foundations for a new Elland Bridge! Brighouse Charity Gala this weekend! CREW health walks this Summer! This entry was posted in Brighouse, Elland, Get Involved / Have Your Say, Greetland & Stainland, Hipperholme & Lightcliffe, July, June, Rastrick and tagged Friday Flyer. Can’t find a job or ever wondered how you could become self-employed / start your own business but don’t know where to start or who to contact? Why not check out the FREE monthly drop in sessions run by Eric Binns from Calderdale Council’s Business Support Team. Whether you are unemployed or employed, you are welcome to attend any session at any location and if you can’t make it to any of the sessions. This entry was posted in Brighouse, Elland, Get Involved / Have Your Say, July and tagged Business Advice, Business Support, calderdale, Calderdale Council, Calderdale Libraries, Drop in sessions, Employment, Get Involved, july, Start Your Own Business, Support.